Drilling chemicals were found in the drinking water of three Pennsylvania households, according to a newly released study. The industry has criticized the research, saying it does not prove the contaminants came from a nearby gas well. The three homes, located in Bradford County, Pa., revealed traces of a compound commonly found in Marcellus Shale drilling fluids. 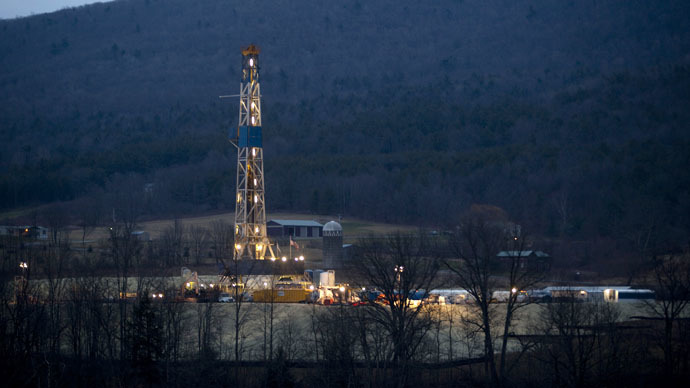 "These findings are important because we show that chemicals traveled from shale gas wells more than 2 kilometers (1.25 miles) in the subsurface to drinking water wells," said study co-author Susan Brantley, a geoscientist from Pennsylvania State University. Brantley added that this is the first published case in which a homeowner's well has shown organic compounds attributed to shale gas development. The research,publishedMonday in Proceedings of the National Academy of Sciences, was based on 2012 drinking water samples from the households' outdoor spigots. The water at one house was shown to contain 2-Butoxyethanol (2BE), a common drilling chemical which is also used in paint and cosmetics. The authors noted, however, that the amount of 2BE found was within safety regulations and did not pose a health risk. The chemical has been shown to cause tumors in rodents, though it remains unknown whether those carcinogenic properties also affect humans. However, the authors say they do not claim the chemicals came from fracking. “We’re not trying to make assertions where we shouldn’t be. We’re looking at all the possibilities,” Garth T. Llewellyn, lead author of the report and a hydrogeologist with Appalachia Hydrogeologic and Environmental Consulting, told Bloomberg. Meanwhile, Brantley said the chemicals almost certainly did not come from the Marcellus – a rock formation more than a mile underground – after fracking. The water did not contain a high level of salt, which is a signature characteristic of fracking wastewater. Instead, the researchers said the fluid likely escaped while crews were first drilling the nearby gas well. A less likely possibility is that it came from a documented surface tank leak in 2009. He added that when his team sampled water wells that were farther away from the drilling sites, they did not find any of the compounds. “When you include all of the lines of evidence, it concludes that [the drilling site is] the most probable source,” he said. The fracking industry has long insisted that drilling chemicals pose no risk because hydraulic fracturing occurs thousands of feet below drinking water aquifers. It has criticized the new study, saying that it provides no proof that the chemicals came from a nearby well. Katie Brown, an energy consultant with Energy in Depth – an advocacy group for the Petroleum Association of America – said the authors have no evidence that the traces of 2BE came from a drilling site. Fracking consists of blasting fissures in rocks thousands of meters under the earth with water and sand to release trapped deposits of oil and gas.